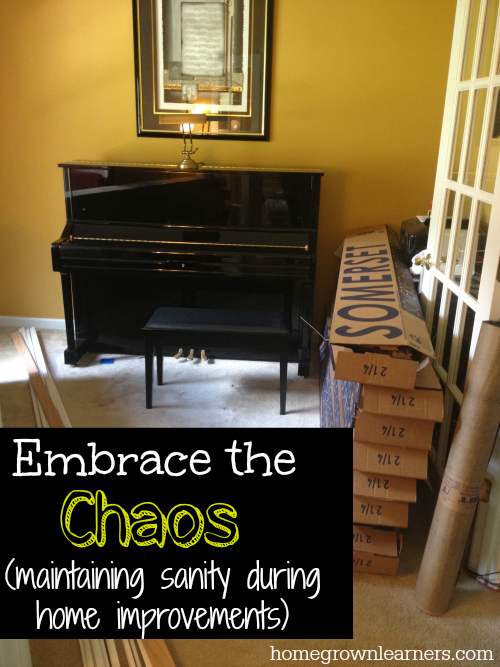 Does chaos drive you a bit nuts? I don't function well with chaos. My husband and I are both Type A and love things to be neat, orderly, and predictable. Somehow my home has gotten a bit unorganized and chaotic. I always have prided myself on being organized and peaceful. I was trying to think back to a time when everything was "in order" in my home and just what caused things to go a little haywire. I think the bottom fell about about 5 years ago when I brought my kids home for school. Since then I just haven't had the time for big projects around my home, and I've also accumulated a lot of STUFF. Over the next few weeks my presence here may be spotty. Between new flooring, painting, general decluttering and cleaning out of a basement, I am not anticipating a lot of time for blogging. In addition to the home improvement projects we also have a series of choral concerts for a children's chorus my daughter sings with, a spring piano recital, and a 3 day Practicum for Classical Conversations. Oh yes - it's also baseball season, which means 2-3 games per week for my son. There's also the matter of standardized testing for my 7th grader. The fundraiser for our youth mission trip to Savannah is also happening, along with a fun project we are starting with a friend of ours who is going to Ethiopia on mission in September. Summer plans still need to be finalized. Sometimes I can get very whipped up about details. Small things can become a big deal and rob me (and my entire family) of joy. I try so hard to not let this happen, but despite my best efforts I often fail. I'm not handling the disarray in my house well. I'm getting irritated by the sheer amount of junk I'm having to sort through. I have to keep telling myself: Put things into perspective! Of all the things I listed above that are on our schedule over the next few weeks, each one is a BLESSING. The children in the orphanages in Ecuador weigh heavy on my heart. My worries and "chaos" are absolutely nothing compared to the lives those precious children live. My family is so burdened by "things". We are making an effort to get rid of many of them. 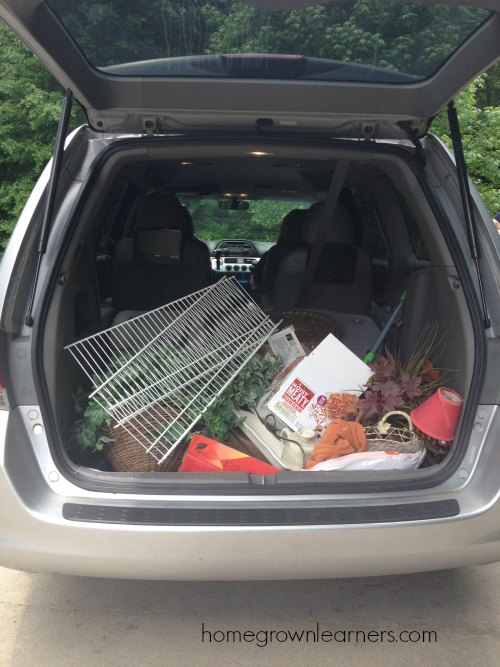 This van full of things we no longer need will hopefully bless someone else. My children are working alongside me; we are having fun doing this together (and stopping for frozen yogurt on the way home from Good Will! ), and hopefully this will promote ownership of the finished projects in our home. How lucky am I to have this TIME with my children - healthy children, and the resources to make changes and improvements to my home? I want to reclaim my dining room (I love this room, but it's been overtaken with clutter recently). My dining room set was a wedding present to my mom and dad 55 years ago! When this room is complete (floors are getting refinished and I will make a few other changes) I want to invite people over more often for dinner. I want to eat in this room more often. The carpet in this picture is probably 17 years old. The paint color has been the same since we moved in 10 years ago. Yuck. I cannot wait for this carpet to be replaced with hardwoods! I have no idea about the new paint color, but I'm sure it will come together. I have a sneaking suspicion there will be a lot of good that comes out of this chaos. When it's all said and done my carpet will be GONE. The yellow walls will be a distant memory. We will have been LIVING our lives and making memories along the way. I'm going to try very hard not to get too disturbed by the lack of order, the many things out of place, and a disturbance in our normal routine. Instead, I want to embrace the chaos and look for all of the blessings to be found in the next several weeks. Don't worry -- I'll be back soon to blog about preparing for our next year in Classical Conversations, a new SQUILT volume, and more! Have you had a particularly chaotic time in your life? How did you handle it? Care to impart any words of wisdom?